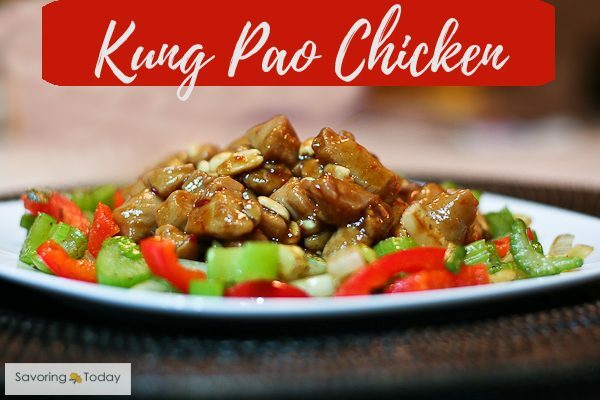 Kung Pao Chicken is a standard on any (American) Chinese menu, and while we enjoy the occasional take-out as much as anyone, it’s always healthier when we control the ingredients. Another great reason to make Kung Pao at home is the freedom to adjust the spice to your own preference. I would classify this recipe in the medium-heat category, so if you like mouth-numbing, spicy heat, just add more of the chiles. Over the years, my good friend and cooking buddy Pati and I refined this dish together. We exchange dried red chilies or chili paste for chipotle peppers en adobo to bring the heat and complexity of flavor. Chipotle in adobo adds a unique smoky spice for a slight fusion twist we think you’ll love. Our low-carb version includes a vegetable stir-fry with fresh ginger for an easy, complete meal in minutes. Want it even faster? Make-ahead cooking instructions are included with the recipe. Double or triple the recipe to freeze so next time you want take-out, you can just take-it-out of the freezer! A quick vegetable stir-fry and dinner is ready in a flash. 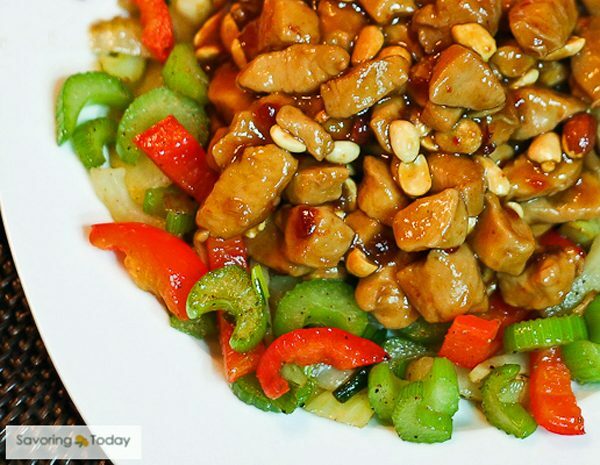 Flavor packed Kung Pao Chicken made with a simple yet delicious sauce and stir fried veggies. This classic Chinese-American dish is the perfect way to make take out healthier at home. In a medium bowl, toss the chicken with marinade; set aside. In a saucepan, combine the sauce ingredients (start with 1 tablespoon of chipotle peppers), except the cornstarch, and mix well over med-low heat. Bring to a low simmer and allow flavors to meld, about 8-10 minutes. Taste and adjust any of the ingredients (add more of the chipotle peppers), to taste. Dissolve cornstarch in a bit of water or chicken broth and add to the sauce. Cook over med heat until sauce thickens, then remove from heat. Heat oil in a large skillet or wok; add the white part of the onions to the pan and cook, stirring, until softened. Add the chicken with its marinade and cook, stirring, until almost done, 2-3 minutes. Add the sauce and stir to allow the sauce to coat the chicken. Stir in the peanuts and chopped scallions. Serve over stir-fry vegetables (directions below). In a medium bowl, toss the chicken with marinade; set aside. In a saucepan, combine the sauce ingredients (excluding the cornstarch) and mix well over med-low heat to meld flavors. Adjust to taste and set aside to cool. Heat oil and add the white part of the green onions to the pan and cook, stirring, until softened. Add the chicken with its marinade and cook, stirring, until almost done, 2-3 minutes. In order to keep the chicken tender, not tough, be sure to not over cook it in this step. Add the sauce and set aside to cool. Once cooled completely, pour into a freezer bag, remove as much air as possible, and freeze flat. If frozen flat, it takes less time to defrost. Reserve the peanuts and scallions for you are ready to serve the meal. Note: The cornstarch is omitted from the sauce when originally prepared because it will lose its thickening properties in the freezer. Instead, it is added during the finishing steps. Make the stir-fry vegetables fresh when you defrost the chicken and sauce. continue to cook until warmed through and sauce thickens 3-4 minutes. Stir in the peanuts and scallion tops. Serve over fresh stir-fry vegetables (directions above). One of my go to Chinese dishes, whether eating it out or making it at home. I’ll have to add some honey next time I make it…my husband would enjoy the added sweetness. Pretty garnish on this dish! So colorful. So flavorful, too — good stuff. Thanks. 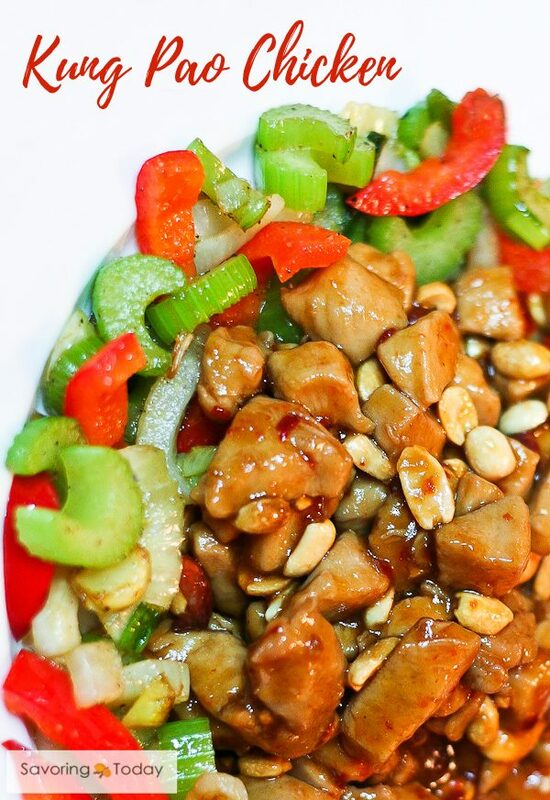 This looks like a beautiful and delicious Kung Pao Chicken recipe. I love that you put chipotle peppers in it. I’ve had a recently renewed interest in this dish and I may need to try your version very soon. Hi Betsy, we love the unique flavor of the chipotle peppers in this dish and I think you will too. Thanks for stopping by! Thank you for the idea of using chipolte pepper in odobo sauce as the heat ingredient in this great recipe. I had some saved in the fridge, wandering what to do with it (other than Mexican dishes). I have Thai chilies, and tons of other “hot” spices, but this worked great! Haven’t tried over half a pepper yet though, but will! Thanks from Nova Scotia, Canada. How fun! I know the one I posted wasn’t GF, so I love to see ideas that are as we have some good friends who are GF as well. Hi! I found this recipe through pennywise platter and tried it the other day. Wonderful dish! I now have enough of the cooked chicken in my freezer for two more meals. This is the closest I’ve come to making something that tastes like a good chinese restaurant at home. Even my DH, who rarely eats leftovers, got to the leftovers before me. Thanks for sharing. Thanks for sharing this recipe. We made it right away after seeing it on NourishingGroumet blog. Next time I will start with 1 tablespoon chilies in adobo sauce! Oh, Sonja, this can be quite spicy, so less of the chilies is a good idea you’re not used to Kung Pao spicy 😉 I do hope you were still able to enjoy the meal! Thanks so much for letting me know, I appreciate the feedback very much. That look so delicious. Thanks for sharing this recipe. Thanks, that is nice of you to say. 🙂 I noticed yours suggests using chicken thighs, which is wonderful. By far one of our favorite recipes. Love your stir fry vegetable recipe!